For text ads on Google, everything revolves around keywords. Keywords are what link a customer’s search to relevant ads created in AdWords. If keywords qualify Ads to be shown for searches on Google, match types allow us to fine tune just how closely aligned searches and keywords need to be in order to show your ad. 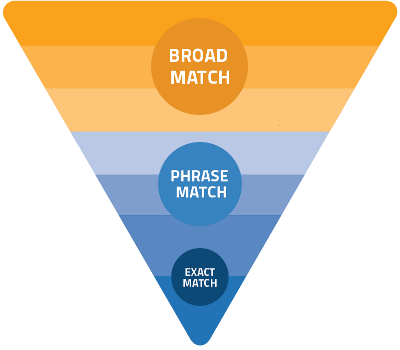 There are 4 different match types that may be assigned to a keyword. These determine how broad or narrow a user’s search will need to be in order to match the keyword. The broader the match type, the greater the reach. However as reach increases, relevancy can become diluted as ads may show for less relevant searches. Enhanced campaigns is possibly the biggest change Google has made to Adwords in the last few years. From the 22nd July Google began automatically upgrading all Adwords campaigns to enhanced campaigns. Hopefully your Paid Search agency were prepared for the change to Enhanced Campaigns, and handled the upgrade of each of your campaigns with due care and attention, keeping you informed along the way. And there is good reason for your agency to have carried out the upgrade rather than letting Google automatically carry out the procedure. For the benefit of those who were there, and those who weren’t I thought I should summarise the key points for future reference! Firstly, don’t forget to test your adtext! PPC is not just about keywords!